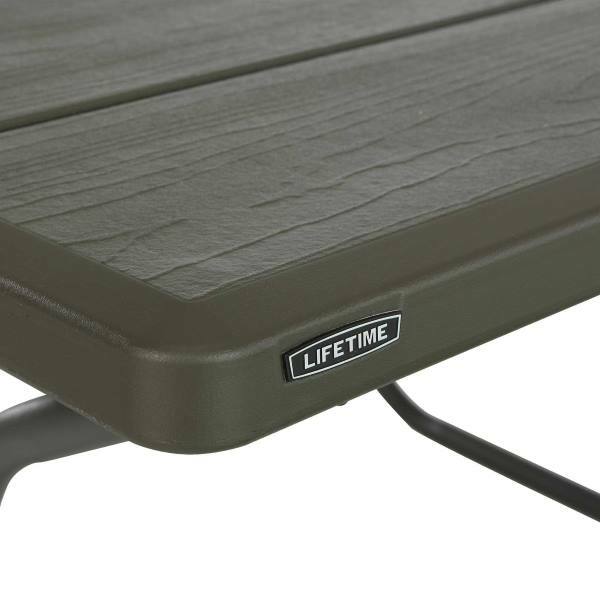 The 4-Foot Picnic Table from Lifetime Products is constructed of heavy-duty high-density polyethylene and a powder-coated steel frame, made entirely in the United States. 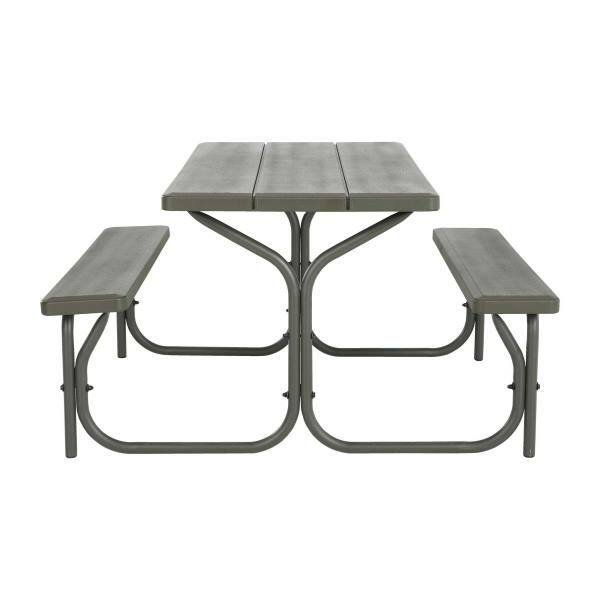 Seating up to four adults comfortably, our picnic tables are stain resistant and easy to clean. The tables are completely waterproof and can endure weathering and rain without chipping or cracking. This model also comes umbrella hole ready, giving you that added convenience while eating outside. 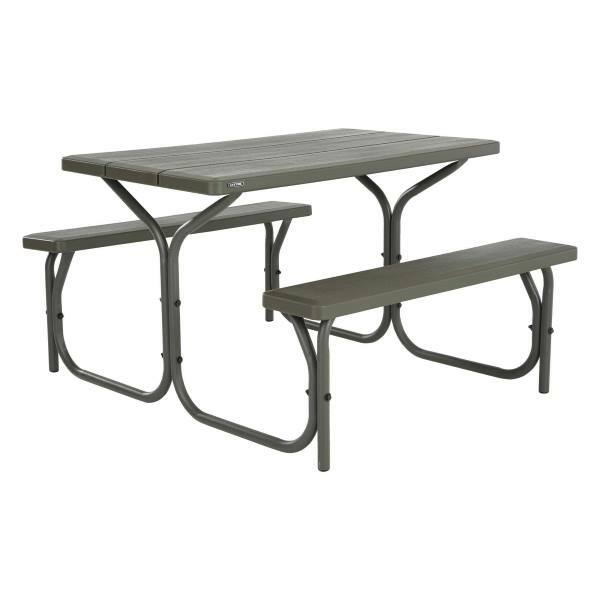 Product Family: 4' Picnic Table. Umbrella Hole Diameter: 1.7 in. *Note: This table does not fold. This is the 3rd Lifetime product I have purchased. I bought two convertible bench/tables as well as this 4' picnic table. I was having a hard time securing the bench seat to the tubing frame. Ryan in Customer Service is sending me out new parts to properly finish the job. Thanks! This is perfect size table for our family of 5. We use it to eat dinner in the backyard. It is very sturdy and well built. I assembled it by myself and the instructions were easy to understand. I love that the table is easy to clean. It is also very easy to move. I can slide it myself or my son and I can lift it together without a problem. It has endured the elements very well and I have enjoyed having a place to eat outside when the weather is pleasant. I have also thought about taking it camping as it could be easily loaded onto a trailer. Down Sizing . . . .
We received this as a house warming gift. We had a larger Lifetime Picnic Table at our old house. We had had it for many, many years. It had been used and abused, but still usable. Only thing was, it takes up too much room, on the new patio. Donating it to a worthy cause. And now, there's just my husband and myself. This size table is perfect. And it almost matches the deck color. Love it, love it ! ! ! I bought a lifetime picnic table, one of the pieces was missing out of the box. I called customer service, I had no issues. Simply told them what piece was missing and they sent it out. The lady on the phone was professional and very helpful. The picnic table itself is. very nice, Light weight and perfect for us. Small Enough To Fit In Our Gazebo. We just bought this and it was real easy to put together, some of the screws had to make their own holes in the plastic but other than that, we did not have a problem. I just love this table, it's small and light weight and easy to keep clean. All you have to do is follow the directions. We have had this picnic table for several years and it still looks like new even after being left outside year round. It is also easily collapsible for moving. It seats four but can fit six adult around this table, has a umbrella access hole Problem: In this size only one color is available, dark gray gets too hot in direct sunlight Response from Lifetime: This is a brand new item for us and is only available in one color at this time. Keep checking back as our inventory changes and we are constantly adding new items and/or colors to favorite items. Q: Does this table fold to store? 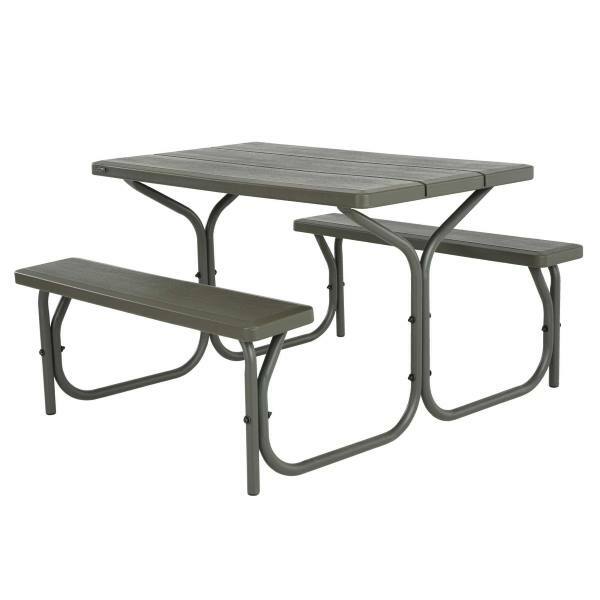 A: This table does not fold, if you need a folding table, then please check out our other Lifetime Picnic Tables. Shipping: Orders for the 60135 Lifetime Table generally leave the warehouse within 1-3 business days. Shipping times vary by location, call for estimates. Dimensions: 48.75" x 40.375" x 3.875"